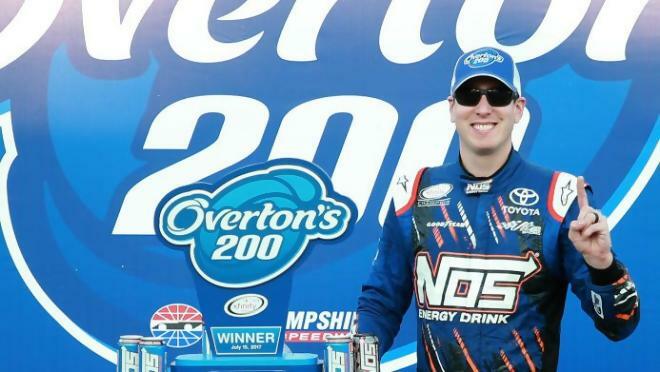 In July of 2011, New Hampshire Motor Speedway was the setting for Kyle Busch's 100th career NASCAR national series victory. A mere six years later, Rowdy was celebrating another milestone in the Granite State, winning Saturday's Overton's 200 for the 175th win of his NASCAR career. The victory pulls Busch within 25 wins of Richard Petty's mark of 200. Busch now has 89 career XFINITY Series wins, to go along with 48 Camping World Truck Series wins and 38 victories in the Cup Series. "It's good anytime you can get to victory lane and I have done it with a lot of groups of guys," said Busch, who has now won six of his last nine XFINITY Series starts at New Hampshire Motor Speedway. "Times kind of change and cars change and evolve, but we are still able to get ourselves into position at the right time and I feel positive for what we've been able to do. This was a really fun race today." Busch became the sixth straight XFINITY Series NHMS race winner to take the checkered flag from the pole position. He now sits alone atop the NHMS all-time wins list with 11. Ryan Preece, who won Friday's Whelen Engineering All-Star Shootout and finished second in the Eastern Propane & Oil 100 Whelen Modified Tour race earlier on Saturday, finished second. It was the best finish in 37 career XFINITY Series starts for Preece, who was piloting the No. 20 Toyota for Joe Gibbs Racing on Saturday - the first of a two-race deal with the perennial powerhouse. "This is something I dreamed about," said Preece, who will be in the car again on July 29 at Iowa Speedway. "This one is for all the short track guys out there that might not get an opportunity like this. This means so much to me. "It means a lot to do it at this stage (of my career) to prove to people I belong here and can improve with more seat time." William Byron, Kyle Larson and Brad Keselowski round out the top-five. "I feel like our team kept improving over the race," said Byron, who currently sits second in XFINITY Series points. "Hopefully we can keep this going through the month of July and continue it into the playoffs." Keselowski had arguably the best car on Saturday, leading on four different occasions for 102 laps. But a costly gaffe on pit road with 30 laps to go forced Keselowski back down pit road for a penalty. He would finish fifth. Ben Kennedy, Elliott Sadler, Ty Dillon, Cole Custer and Brennan Poole round out the top-10 finishers. Stage 1 (Laps 1-45) Sitting in third after a 54-minute break for rain, Larson took advantage of some hard racing between Sadler and Allgaier to earn the win in the first stage. Watching Sadler and Allgaier battle door-to-door for 10 laps, Larson zipped passed the two and pulled away from the pack. Ryan Preece, winner of Friday's Whelen Engineering All-Star Shootout modified race, put in a valiant effort to catch Larson, but couldn't get the No. 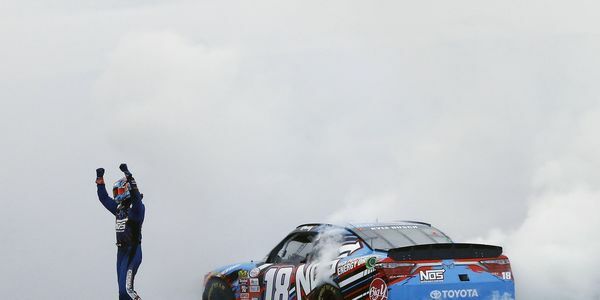 20 Joe Gibbs Racing Toyota within striking distance before the end of the stage. Busch, Sadler and Brad Keselowski rounded out the top-five after Stage 1. Stage 2 (Laps 46-90) Preece couldn't get to Larson before the end of the first stage, but he did get to him at the beginning of the second. The native of Berlin, Conn., stayed with Larson on the restart and finally pushed ahead to lead for two laps before Busch, the pole-sitter, finally chased him down and grabbed the lead which he held for the first 22 laps of the race. Busch held the lead until Keselowski methodically closed the gap and passed Rowdy coming out of Turn 2 on Lap 73. Keselowski pulled away from Busch for the final 17 laps to capture Stage 2. Busch would hold on for second, while Larson, Preece and William Byron finished third, fourth and fifth, respectively.
.@KyleBusch sets timeline on @NASCAR_XFINITY retirement.